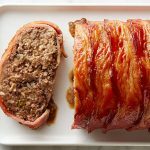 This bacon-wrapped meatloaf is moist, tender and flavorful. Your family and guests will surely love this on special occasions. Perfect for someone who is on a low carb and keto diet. In a big bowl, combine the ground beef, the bacon chunks, the garlic, the chives and the coconut milk. Mix well until all the ingredients hold together. You can use an electric mixer to save some time. Then season the mixture with freshly ground black pepper to taste. Form the mixture into a log shape and wrap with bacon. Remove and slice into 1/2 inch slices and serve with fresh parsley sprinkled on top.